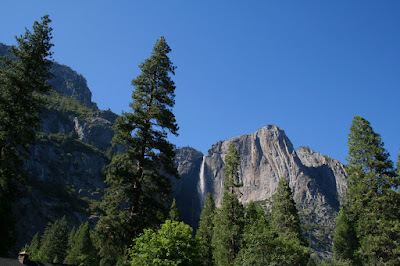 On our very first night at Yosemite National Park, me and the kids did a short walk to Lower Yosemite Falls and scrambled around on the rocks a bit. Not easy in flip flops! I hadn't planned on rock scrambling so did not wear appropriate shoes :) I did have hiking boots with me, I just didn't wear them that first day! 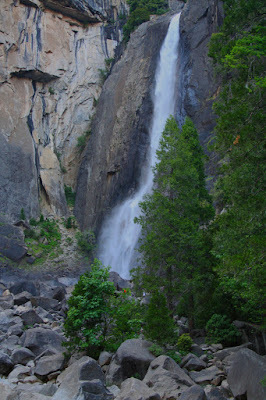 A waterfall in Yosemite Valley. Sam, Savannah and their niece Kira by the Merced River near Housekeeping Camp where we stayed the first night. 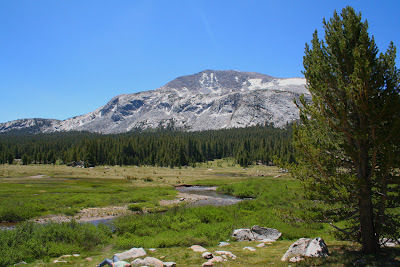 Hiking to Dog Lake, a glacial lake near the Tuolomnne Meadows area of Yosemite National Park. Right is Zofi and Savannah. Left is Lazer giving Kira a piggyback ride, Savi and Zofia. Dog Lake was so damn cold i could not go in...but it didn't stop the kids! 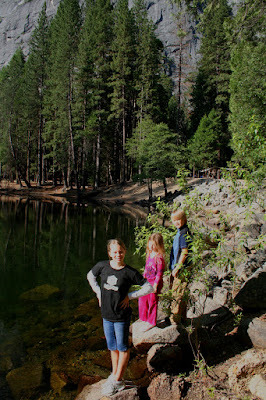 Playing on a rock in the Merced River, Yosemite N.P. It was icy cold! Took my breath away! 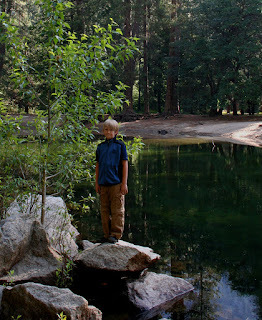 On the right, Sam beside the Merced River. He was so enthralled that the river was so clear you could see the trout and he wanted to go fishing so badly! 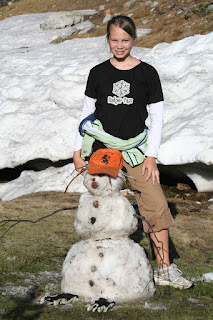 Believe it or not, this was my kids' first experience with snow! 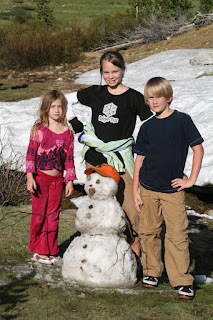 They had seen snow as babies/toddlers in Alaska but this was the first real in the snow playtime. 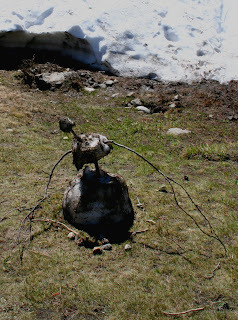 It was a snowpack just outside of Yosemite N.P. 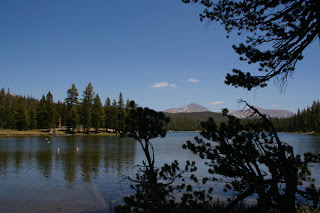 at the Tioga Pass entrance. 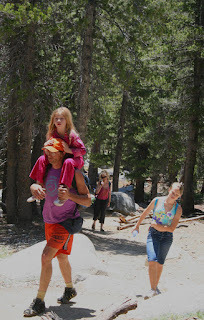 The photo above is my brother Lazer, my niece Kira (in pink) and my kids. A meadow near the Tuolomne Meadows region of the park, where we stayed the second night. Savannah at the snowman the day before, and the pathetic anorexic-looking snow-thing the next day. I love this poor little guy! 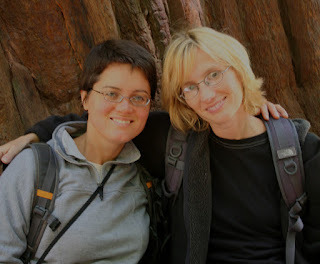 Daline and I at Muir Woods (left). Coastal redwood (Sequioa) foliage (right). 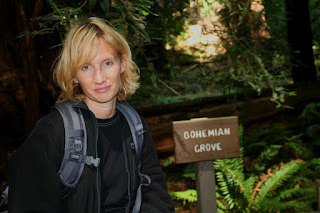 Me at Bohemian Grove in Muir Woods - must have been named after me! 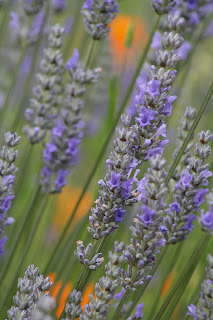 Lavender at Green Gulch Zen Center Organic Farm. I love these photos. 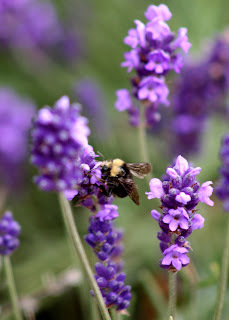 On the left, this is a different variety of lavender, and the orange flowers in the background are California poppies. Daline in the garden (left). 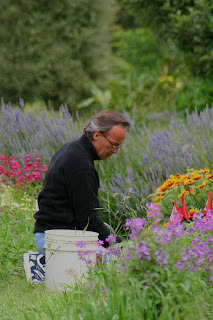 Someone from the Zen center working in the gorgeous flower garden. 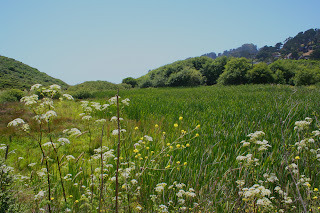 Hills of Taumalipas - the trail through Green Gulch to Muir Beach. 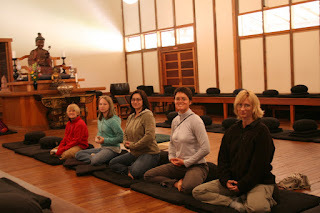 Me and the kids and Daline and her sister Jackie inside the zendo, where they do their "sitting" practice. Daline playing on a type of drum (right). 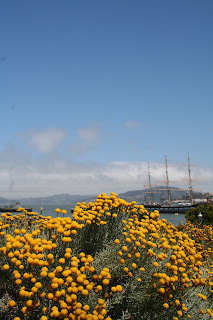 Flowers over San Francisco Bay, and a California Poppy (right) - one of my favorite flowers! 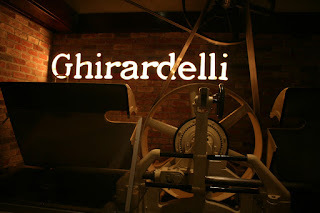 Ghirardelli "chocolate factory" in Ghirardelli Square, SF and an awesome meal at the Melting Pot - we were stuffed! Got in at 1am last night from an awesome trip. I haven't uploaded the pics yet, but will soon. Just wanted to post some highlights. Also my OnEarth podcast is now live (an interview of me by OnEarth editor Laura Wright), and Alternet picked up my article (30 Days of Consumer Celibacy) and they have a whole discussion forum devoted to it, which is kind of cool. There are people discussing it, mentioning the best points, even calling me lazy and then others defending me. It's great - my own little mini-celebrity forum! I have to laugh because I like to call myself a Q-list celebrity. Ha! Playing in the snow (my kids' first time to ever see snow!) 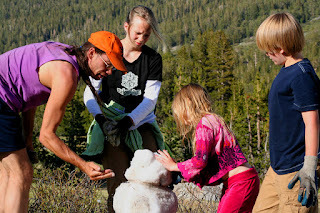 and watching them laugh, make a snowman, throw snowballs, slide down the snowpack. 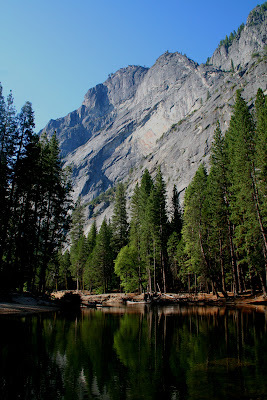 The beautiful crystal clear Merced River. 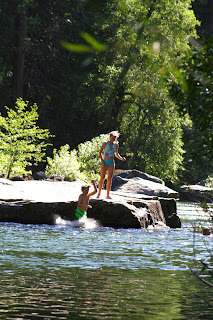 The kids swam with Lazer while Z and I hung out and chatted, though I did go in to the very cold river later. It took my breath away! 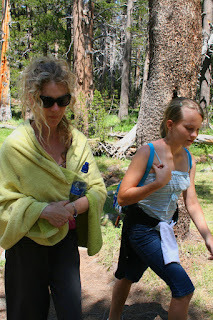 The short walk to the Lower Yosemite Falls with Sam, Savannah and Kira and climbing over the boulders to get closer. Feeling the spray on our faces. Listening to Kira and Sam laughing in the backseat of the rental car playing Tamigachi (sp) as they would send "poop" in the mail to one another via their electronic game! LOL. Spending time getting to know Daline's mom and sister Jackie better, and of course seeing Daline! Showing the kids an alternate way of life, and discussing with them different religions, and Buddhism as a philosophy and the similarities of its teachings to Christianity. Watching my best friend dedicate her life to the 10 precepts, which are very similar to the 10 commandments. The ceremony had me tearing up a couple of times! Getting a tour of the organic garden at the Center, where Daline had worked. They had a gorgeous flower garden. The kids enjoyed this too. Walking down to Muir Beach. My 2nd visit to Muir Woods and the kids' first. I love how the vegetation reminds me of my childhood forests in Oregon (though no coastal redwoods there). It's always beautiful and we just did the basic hike down and back to the visitor center. Eating a 4-course meal at the Melting Pot fondue place!! We had cheese fondue, then salad, then you cook your food in bouillon (filet minon, teriyaki beef, chicken, shrimp, ahi tuna, and veggies) and then for the grand finale, chocolate fondue. Yum! Fisherman's Wharf in SF was really cool. I got a couple sweatshirts for the kids, and a few gifts for people. Just walking around was neat! Lunch at the Boudin Bakery - chowder in a bread bowl! I seem to be overcoming my gluten allergy as I'm not reacting like I used to. Seeing the sea lions at Pier 39. I wanted to go to Alcatraz but we didn't have time. Next visit! It was neat to see it offshore though. I'm glad that the kids had such a great time and got to do a lot of cool things and see a lot of neat new places and things. It was a great trip! I went blueberry picking this weekend with the kids and some of their friends - it marks our 9th year berry picking and me and the kids got a whopping 16 pounds!!! I need some blueberry recipes... mostly I love to freeze them so I have them throughout the year for smoothies. I paid $24 for the 16 pounds so it's way cheaper than the grocery store. And it was sooo humid I was soaked in sweat! This year we went with some friends from the kids' school. 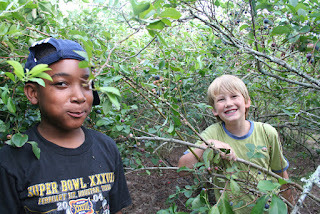 To the right is a photo of Tre'-Anthony and Sam - someone has a mouthfull of blueberries I think!! The pic below is a self-portrait of Susan and I (Tre' and Nick's mom), and Savannah brought her friend who liv es across the street. Susan enjoys photography also and so one day soon I will link to her new blog! When she gets one! ;) hint hint Susan! Saturday night I attended a fundraising gala for the Humble-Kingwood Fil-Am Foundation who are building a sustainable village in the Philippines through the nonprofit organization Gawad Kalinga. I want to write an article about this very awesome project. It's being organized by two professors from Kingwood College where I used to teach, Geology professor Cherith Letargo, who grew up in the Philippines, and Biology prof Brian Shmaefsky. They plan to run an Environmental Geology class in Spring 2008 that will plan and then fly over there to actually help the villagers build the community. Gawad Kalinga has the motto "No More Slums" and it's similar to Habitat for Humanity except that the individuals who get the homes have to help build a neighbor's home first and then they qualify for their own. They don't pay anything but rather use a system of sweat equity. The villages are really nice, and funds are raised to help put in schools and clinics as well as teachuing them about hygiene and other things. Gawad Kalinga was started in 2001 by Couples for Christ to take care of natural-disaster survivors who often ended up in slums in Manila. One amazing thing about this ministry is that there are Muslims and Christians working side by side. Sponsoring groups from many countries have helped, including France, Australia, Germany and Virginia USA. Now Humble-Kingwood will have a village built! I am so impressed with this ministry and hope I can sell an article on this idea so I can travel over with them next spring break. I'll see if Cherith can let me borrow some pics to put up here. She and Brian went over there last year to scope out the situation. Next Thursday I'm heading back to Cali, this time with Sam & Savannah. We fly to San Francisco, and will head up to Yosemite National Park with my adorable niece Kira, her mom Zofia, and my brother Lazer. I have never been to Yosemite so I'm excited about that. 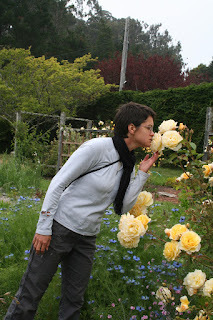 Then I head back to the Bay Area to go to Green Gulch Zen Center for a couple days. We're staying in a guesthouse there. It's beautiful - the property goes right down to the ocean. I still need to upload my photos from my visit to LA and Paige and Hugh's wedding!! I bought a new computer, so it's been 3 weeks of transferring files and all that madness. And THEN I had to take the whole darn thing back to the store 2 days ago because it was having some problems. So if you have read my Compact article, you will realize I am not longer "celibate"... in terms of my buying habits :) So OK I finally did it - here are some photos from my last trip to Cali a few weeks ago! Hugh and Paige! It was the most unique wedding I've been to. 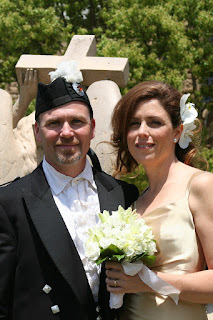 She wore a beautiful gold dress and he wore a Scottish kilt! 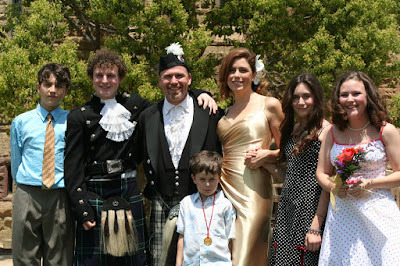 They honeymooned in Scotland, which is where Hugh's ancestors are from. The rehearsal. 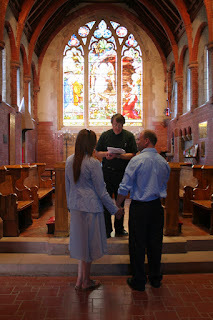 This is the Church of the Angels - a beautiful chapel. 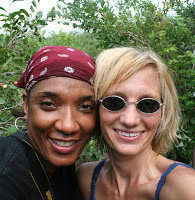 Dana and Tricia. Tricia graciously let me stay with her, and she runs the awesome coffee shop (2 locations in the L.A. area) called swork. Check it out http://swork.com/. Swork stands for the synergy between success and work. 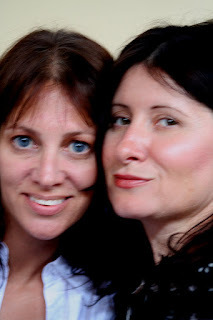 Dana is a massage therapist in Santa Monica! We all stayed together at Trish's - I loved these gals! 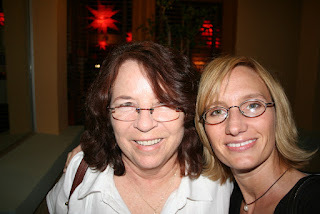 Judith Stock, a longtime writer friend/colleague and I got together at a great little Italian place. 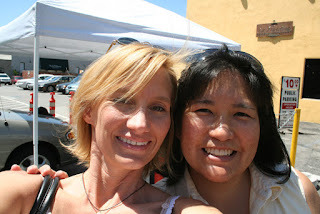 It was so nice to meet her after all the years I've known her! I love it! My article on my month-long foray in The Compact - an agreement to shun new purchases in lieu of used ones - has come out in OnEarth. I love the artwork - it cracks me up! Check it out: My 30 Days of Consumer Celibacy. And I also recorded a podcast interview with OnEarth editor Laura Wright that you can listen to here. (NOTE the podcast is not yet online but will be soon). I had a great time camping and canoeing this past weekend. A friend and I camped at Mission Tejas State Park for 2 nights. Saturday was the 10-mile Neches River Rendezvous and we took my tandem kayak for a 2.5 hour paddle down the bayou through lush woods. The water level was very high from recent rains. It was a fun paddle. The weather was perfect, which I was so happy about because the forecast the week before looked like it may storm. The man upstairs held out the rains until the next day... yea! We packed up our tents and went to see the land where the Neches National Wildlife Refuge was established, though currently embroiled in a lawsuit. Then the heavens sent down their torrential downpours and thunder and lightning. Luckily we got into the landowner's truck and went on our way, driving through the muddy river bottoms and streams and sloughs. 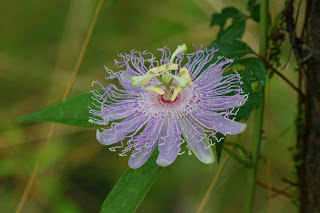 It was very pretty, and I saw passionflower (in photo), Echinacea (purple coneflower), winecups, and many other wildflowers, along with a lush, green forest with oaks and sweetgums and hickories and more.